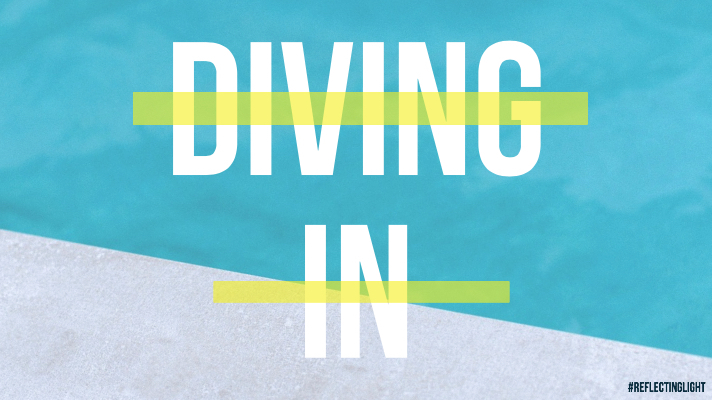 Summertime is here and there’s only one way to beat the heat and that’s by diving into the swimming pool. Both of my girls are really strong swimmers. In my former years, I was a lifeguard and swim instructor, so as soon as they could hold their heads up, I had them splashing around in the pool. As the years passed, they became more and more confident in the water as I worked with them. Ready, hold your breath, now kick, move your arms like a clock. That’s it! You’re doing it! And before long they were jumping off the diving board like a boss. But the thing about a diving board is that it’s best used for dives. Yes, you can make a better splash by doing a cannon ball, but if you want to enter the pool gracefully, you must dive in head first, which is harder by far. Watching Ella learn to dive reminded me of how often I hear the Spirit say, “April, get your head down in my Word. Stop looking around at what other people are doing and dive in.” Sometimes it takes a few face flops before I get it, but once I do glide in gracefully, it feels wonderfully refreshing. And I want to do it over and over again. Thanks for this reminder! For me I get frustrated because I might not be as far along in my walk as I think I should be, or someone else knows more so I give up. I just need to put my head in His word and keep moving forward for me. Exactly! The enemy tries to get us distracted to the point where we give up reading God’s Word altogether. Keep diving in, my sweet friend! Much love to you today and always.